US National Security Advisor John Bolton called Azerbaijani President Ilham Aliyev on January 29, the presidential press service reported on the morning of January 30. This chat on the phone came a few days ago, immediately after the meeting of President Ilham Aliyev and Armenian Prime Minister Nikol Pashinyan on the fringes of the World Economic Forum in Davos and Bolton’s phone call to Armenian Prime Minister Nikol Pashinyan. But then in Yerevan they assured: Karabakh was not discussed by Bolton and Pashinyan. And now after Bolton’s phone call to the president of Azerbaijan, both in Baku and in Washington, they officially confirmed that the Karabakh conflict was discussed. And this is another weighty argument in favor of the fact that the Bolton plan for the Karabakh settlement does not just exist, but is actively promoted and advanced by Washington. If, of course, for someone these conclusions are insufficient, we should also remind Karabakh statements by American diplomats ahead of Bolton's visit to the South Caucasus, and Bolton’s remarks that the United States expects Pashinyan to take "decisive steps" for the settlement, and most importantly, Russia's nervous reaction to the fact that Bolton marked the US interest on Karabakh. Moscow really has a reason to be nervous. Until recently, “by default” it was believed that only Russia could initiate its own mediation missions on the Karabakh settlement. In 2011, Moscow made a very loud statement for such a mission. It went so far that Andrei Kelin, then director of the Fourth Department for CIS Countries at the Russian Foreign Ministry, loudly told reporters: "Russia has returned to the Caucasus," and added that there would be "nothing without it, neither war, nor peace." We do not know for sure whether Kelin let slip that the regional conflicts in the Caucasus are being inflated and maintained "in working order" by Moscow. Another thing is important: that Russian mission ended, let us recall once again, a loud and deafening failure. 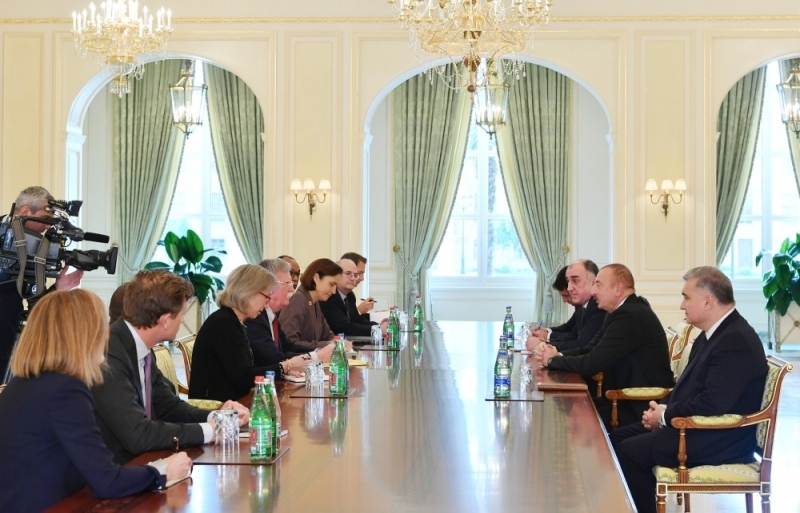 Another meeting of the presidents of Azerbaijan and Armenia, Ilham Aliyev and Serzh Sargsyan, was held in Kazan in June 2011, on the fringes of the Sabantuy holiday and racing for the prize of the president of Russia. But at that time, there appeared on the negotiating table not a document the presidents agreed on at previous meetings, but a new and much more profitable for Armenia. After it the president of Azerbaijan interrupted the meeting and did not stay at the races either. Now the United States took up the matter, and took a very active part. It is clear that the details of this plan are not disclosed. Nevertheless, many indirect signs indicate that the “Bolton plan” gives our country serious reasons for optimism. Strictly speaking, this was testified by the sensational statements of American diplomats on the eve of Bolton’s visit to the region, especially if you compare them with what they said, or rather, what Russian diplomats did not say. We should recall that Washington’s representatives spoke about respecting the territorial integrity of Azerbaijan, and the need to withdraw Armenian troops from the occupied Azerbaijani lands and about the implementation of the UN Security Council resolutions on Karabakh, while their Russian counterparts limited themselves to toothless “we support peaceful conflict resolution". Another thing is noteworthy. The telephone conversation between Aliyev and Bolton took place just before the fifth meeting scheduled for February 20 of the Southern Gas Corridor Advisory Council. Deputy Assistant Secretary of State for Energy Diplomacy Sandra Oudkirk will visit Azerbaijan to participate in the event. In fairness, the United States has always paid attention and supported the Azerbaijani oil and gas projects. But now this support is reaching a much higher level than before. And this support has a distinct political “reading.” Russia is actively using its gas supplies to Europe both as a means of pressure and as a tool for bribing. Until recently, this state of affairs didn’t really bother anyone; moreover, against the background of memories of the “energy crisis” of the seventies, hydrocarbons from the USSR, and later from Russia were perceived as a good alternative to Arab energy. Today the situation is fundamentally different. Washington is actively opposing Russia on the gas market in Europe. Great importance is attached to the Azerbaijani project of the Southern Gas Corridor. It is suffice it to recall the talks between the US president and the Italian prime minister. And this already opens up opportunities for Baku to discuss with the United States the same energy projects in close "coordination" not only with the energy security of Europe, but also with their own security issues, where in the first place is Karabakh. And yes, such a circumstance: the United States is also unlikely to be delighted with the "smoldering" conflict near such important oil and gas pipelines. “The tension between Armenia and Azerbaijan remains a potential source of a large-scale military conflict that could draw Russia (into it).” All this makes the US rush and act more assertively. And yes, one more thing. Unlike the Russian Federation, where they still think in terms of the First World and Sykes-Picot Agreement, in Washington, in principle, they do not like the forceful re-alignment of borders, especially after the Crimea, and in favor of Russian outposts. So Azerbaijan has every reason to be optimistic about the implementation of the Bolton Plan in the region. Another question is how not only in Moscow, but also in Yerevan, they will react to these new “moves” in Karabakh. Anxiety is growing in Armenian society about the fact that the talks didn’t discuss what was promised at the “Karabakh” rallies in the late eighties, and this anxiety is skillfully heated by Russia. Only here it is better to keep in mind what Levon Ter-Petrosyan warned about: an alternative to negotiations, where a "disadvantageous" option is offered, is war. And in this war, the balance of power is not the same as it was in the early nineties. And yes, John Bolton, during his visit to the region, also spoke about the possible supply of weapons. Armenian lobbyists in the United States never doubted that Azerbaijan would buy it and Baku has already U.S.-made BELL helicopters in service.